Traditionally, there were a few leaders who held all the power, while followers executed the strategy created from the top. Flattening organizational structures have resulted in fewer boundaries between leaders and followers, and as a result, “leaders can no longer trust in power; instead, they rely on the power of trust” (Forbes). Additionally, to be successful in today’s business world, you need to be able to build and nurture relationships. Trust is the foundation upon which all relationships are based. Whether you are new to leadership or are starting with a new organization, one of the first objectives on your task list should be creating trust. Here are four actions you can take to develop trust within your team. Within moments of meeting someone, you create perceptions and assign them all sorts of traits. As a result, we may decide someone is not productive or is going to be a problem to deal with based on our “gut-feel”. We treat our perceptions as fact and this can cause us to lose our ability to lead effectively. Seeing reality as you’d like it to be won’t account for how others see the action undertaken or words spoken. If others perceive your words or actions as untrustworthy, trust will be broken. Much as we expect the best from ourselves, we should expect the best of others. Furthermore, if we want trust, we have to give it. 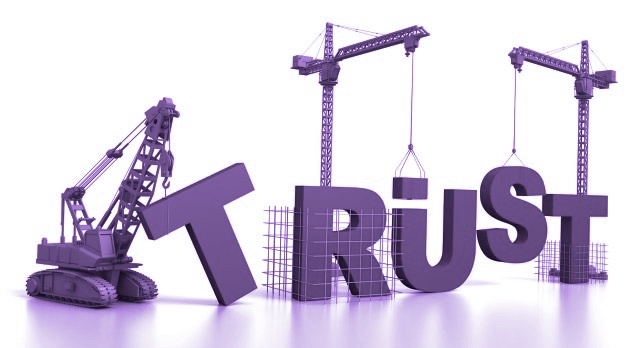 If you’re withholding trust until you think it’s earned, you’re fuelling disengagement. Instead, challenge your perceptions and make your conclusions based on performance. Help everyone perform at their best: understand their strengths and delegate tasks or create opportunities that allow them to shine. When you give trust you tap into another’s self-esteem and confidence, spurring engagement and creativity. One of the most important steps in developing trust is doing what you say you will do consistently. Others pay attention to your behavioural integrity (the alignment of words and actions) and even small things, such as frequent rescheduling or failing to follow through, can cause others to question your trustworthiness. Should you be unable to accomplish the task, take ownership of the situation. Apologize and explain face-to-face why you are unable to deliver. It is important to not marginalize the task, especially if it was a promise. While it may not seem significant to you, it may mean the world to the other person. Find a solution and make sure you are part of it or can lend the necessary support to accomplish the objective. Wanting to increase collaboration or improve communications is easy to talk about, but can be difficult for others to act on. Help them understand your objectives by making them tangible and purposeful by painting word pictures. Speak to the how and make it clear what you’ll bring about. Take that one step further, be the messenger and model the behaviours you want from others. Be open and volunteer information when you can. If an opportunity sounds vague, it is your chance to provide information. It’s important to not omit details or use half-truths as it is easy to confuse stories and this damages your credibility. If you are not prepared to share information, say so. It is better to set a boundary than to be vague! Keep information shared during personal or 1-on-1 conversations to yourself. It’s easy to let things slip when emotions run high. If it happens, own it and apologize. Keeping your emotions under control increases others trust in you as it lets them feel they can predict how you will respond. In a similar manner, be aware of your style of communication. Successful leaders use assertive communication to set limits, reward performance, and provide information. Sometimes our efforts to make light of situations can be perceived as abrasive, especially if we use indirect styles of communication such as sarcasm. Other behaviours and communication styles that can destroy trust include isolating yourself, talking about others without them present, or humiliating others. If you realize you have mistreated someone, once again, own it and apologize. Commit to altering your own behaviour and approach when appropriate. In all these situations, avoid approaches that lead to you lying or not being open. Base your conversation on the objective you are trying to achieve and use questions to gather and share information. Provide your perspective and offer your willingness to listen and adjust your perspective based on their responses. Remember, a promise alone will only restore trust in the short-term and an apology itself does not have any effect on long-term trust. Developing trust in your team creates the foundation for an energetic culture filled with collaboration, innovation, and unity.